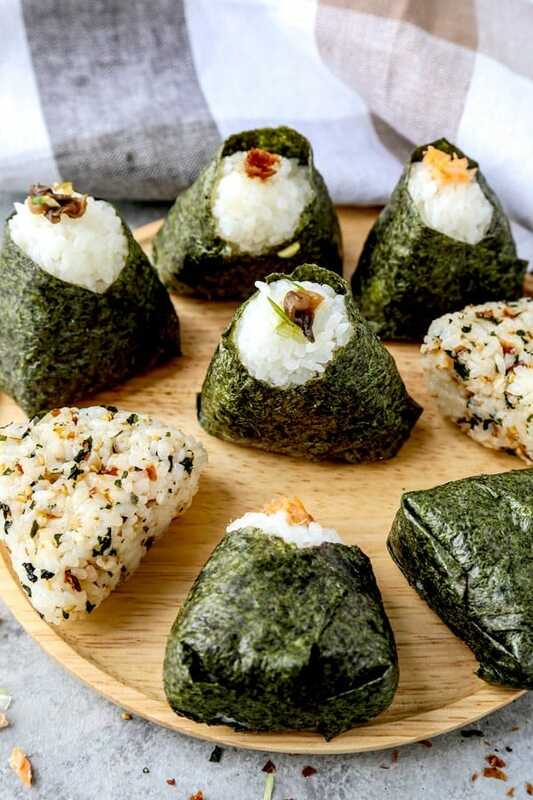 Whether you call it Onigiri – おにぎり – or musubi, there’s a lot to love about Japanese rice balls! Salted and lightly compressed rice filled with goodies like pickled plums or okaka and wrapped in sheets of nori. YUM! 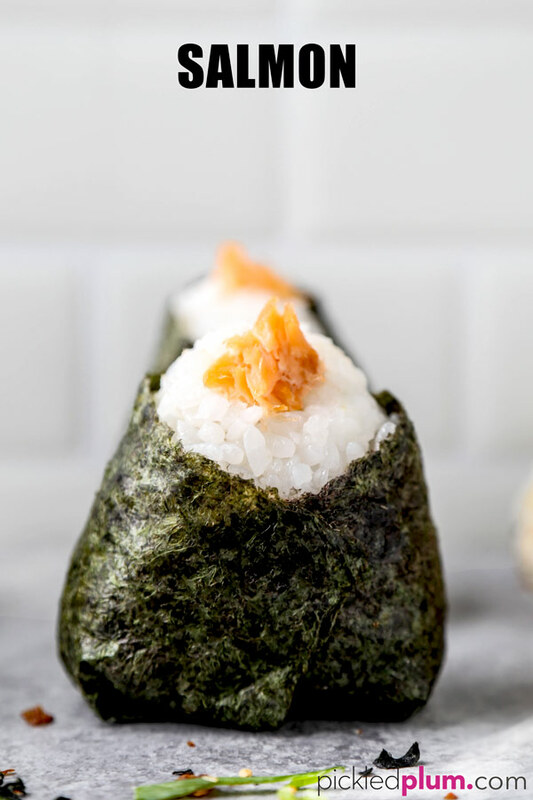 Learn about the origins of onigiri, the best rice to use and step-by-step directions to form your own perfect rice balls at home. Plus four delicious, easy to make onigiri recipes! “Let’s go to 7-Eleven,” are words that commonly come out of my mouth when I’m in Japan. Whether it’s in response to my Mom asking me what I want for lunch, or a gentle (not so gentle) suggestion to Ben when he asks if I’m peckish. I tend to say it a lot! You see, the Japanese konbini (convenience store) is worlds apart from its North American counterpart. Instead of a predictable aisle of chips, frozen burritos and the same old soft drinks – it’s a place you can go to get everything from fresh soba, katsudon, takowasa, melonpan, oden, fried chicken, whisky, amazing ice cream bars, a dizzying array of energy drinks to an emergency umbrella if it’s raining. Heck, you can even pay your gas bill there. In fact, it would probably be easier to list what they don’t have than cover everything they do! But if I had to narrow it down to one thing that, if they stopped appearing on the shelves, would make me absolutely LOSE IT, it would be onigiri. Yep. The most simple seeming of all konbini fast foods – Japanese rice balls – are what I end up craving the most. And onigiri are way more than just the sum of their parts. There’s a magical elevation that seems to happen when cooked and salted rice is stuffed with things like sashimi-grade spicy tuna, and is then wrapped in nori (seaweed sheets). Whether as a snack or as part of a meal, onigiri tend to be flavor packed and super satisfying. My fave! Today, we’re going to unwrap the mystery on how to make rice balls at home. 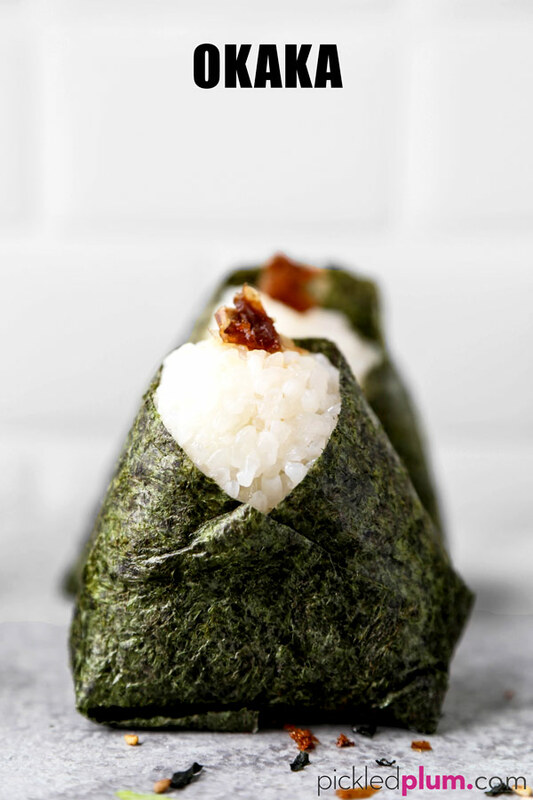 And we’ll level up your onigiri game with three easy to make onigiri recipes – along with a simple bonus preparation. Onigiri (おにぎり) – also called omusubi and nigirimeshi – is a Japanese rice ball. It is often times formed into triangular shapes – and can be wrapped in nori (paper-thin sheets of dried seaweed). 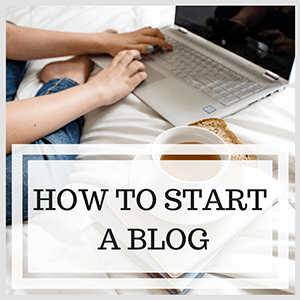 Even though that is the most common presentation, it is hardly the only (more on that a little later). And while I may have just portrayed it as a plastic wrapped snack you grab at any Japanese konbini for ¥100, there is a long history of onigiri in Japan. You see, onigiri are the original traveling food. Lightly salted rice, compressed into easy to handle single-servings has been in the packs of everyone from travelers to samurai to picnickers to infantry soldiers for centuries in Japan. Those rudimentary first onigiri may have been little more than compressed, salted rice. However, the widespread consumption of rice balls meant that the form persevered – and became a ubiquitous way to consume rice throughout the years. Anchored in Japanese food culture for centuries, these rice balls have taken on new forms and ingredients. But – even with new permutations – the basis is much the same as the original all those years ago. What’s the difference between Onigiri and Musubi? The short, easy answer is that there’s no actual difference. 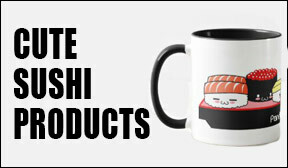 An onigiri is the same as a musubi regardless of what the label at the store says. It’s still a riceball. Well, why the multiple names then? The name preferences are more regional than anything. And while there are a ton of regional words at the local level for onigiri, the two main ones are onigiri and musubi. The closer you are to the Kanto region (an eastern region that includes Tokyo), the more likely you are to hear Japanese rice balls referred to as musubi – or O-musubi (more on that in a sec). And the closer you are to the Kansai region (which includes Kyoto), the more prevalent the usage of onigiri becomes. Then, what’s the thing with the O? I mean, is it musubi or O-musubi? The simple answer here is that the O in question is an honorific prefix. Think of it as a way to impart respect and a feeling of politeness to a word. It’s a simple prefix used to honor something important by adding a little beauty and reverence to the language. Therefore, water (mizu – 水) becomes o-mizu. Soy sauce (shoyu – 醤油) becomes o-shoyu. Now, again, these terms are interchangeable – and, for the first time listener, it can seem confusing on where to use the honorific O. Since rice is a huge part of the the Japanese food lexicon, though, it stands to reason that you might hear musubi dressed up with an O at the beginning. But, don’t worry! This isn’t a language lesson! I’m all about the cooking, as I know you are too. So let’s get cracking on making onigiri! First, let’s get this out of the way: while it can seem intimidating to make these perfect parcels of Japanese rice for the first time, it’s totally doable! There are a couple of EASY tricks I’ll teach you that will keep the train on the tracks, and have you cranking out onigiri like a Japanese master. And, hey, if all else fails – there’s absolutely no shame in picking up an onigiri mold. 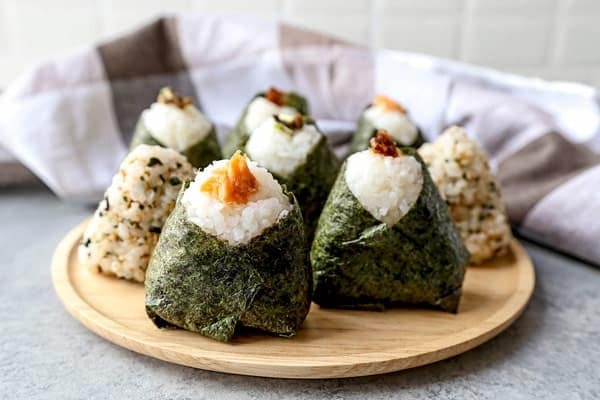 It’s a plastic triangular mold that will not only shape your own homemade onigiri recipe perfectly, but will also have those Japanese rice balls turn out in a uniform size. Another hack is to use a bit of kitchen plastic-wrap to help you mold your onigiri without them possibly falling apart in your hands. Regardless of how you achieve your own onigiri creations, it may take a bit of practice at the beginning. Don’t worry about the trial and error. You still get to eat the failures! The cool thing is that one day you’ll be molding musubi in your kitchen and you’ll lose track of time. You will have gotten so good at it that you don’t even realize you’re doing it. I like to have all of my ingredients laid out in front of me. Well organized mise en place just makes the whole process run smoothly. So… take a full sized sheet of nori (seaweed) and cut it lengthwise into thirds. Next, wet your hands in water (I leave a bowl of water on the side with my ingredients). This important step will keep the rice from sticking to your hands – and allow you to mold your onigiri easily. Then place between ⅓ and ½ cup of cooked Japanese rice in your wet palm – and create a small indentation in the middle with your thumb. Add about ½ tablespoon of your filling to the indentation and then enclose with the rice. Now, form the rice between your two palms into a triangular shape. Try not to press too hard (but hard enough that your rice holds a shape). It’ll take some practice, but you’ll get it! At this point, I like to sprinkle the exterior my rice ball with a bit of salt. If I’m making multiple onigiri with different fillings, I like to put a tiny bit of that filling on top of my completed rice ball, so I know which is which. The finished rice balls all tend to look pretty similar, ha! Note: when I’m making furikake onigiri (more on that version in a sec), I mix the rice seasoning into the cooked rice and simply mold my rice balls into shape. I don’t usually add a sheet of seaweed to this prep (but that’s totally up to you). What type of rice is used in Japanese rice balls? You know I’m all about taking it easy (and making it simple on myself) in the kitchen. 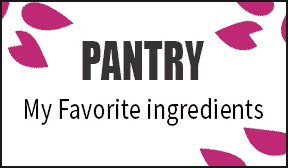 I like experimenting with ingredients so I know what element I can substitute in a recipe if I’m ever in a pinch. It makes me an agile cook when I realize that I don’t have something I need while preparing dinner – but can just use something else instead. 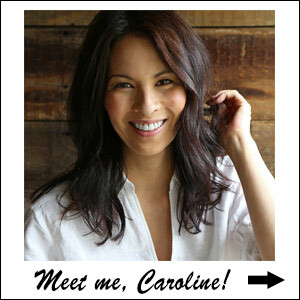 I love telling you about alternatives to ingredients, so – if you’re missing something in your pantry – you can take it easy on yourself too! Well, when it comes to the rice element in these yummy Japanese onigiri – I hate to tell you – there is no substitute for using Japanese rice. You see, Japanese rice is a short grain that, when cooked, has the perfect texture for making onigiri. 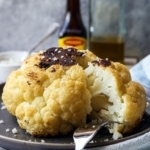 The grains will stick together slightly while retaining a fluffy yet toothsome nature. My favorite Japanese rice for making onigiri is Koshihikari. The small, dainty grains just deliver a chew that is outta this world! 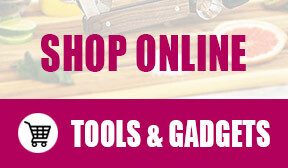 The drawback is that it can get a little expensive. A really good alternative would be Tamanishiki, which I tend to use in everything from onigiri to bento to chahan (Japanese fried rice). 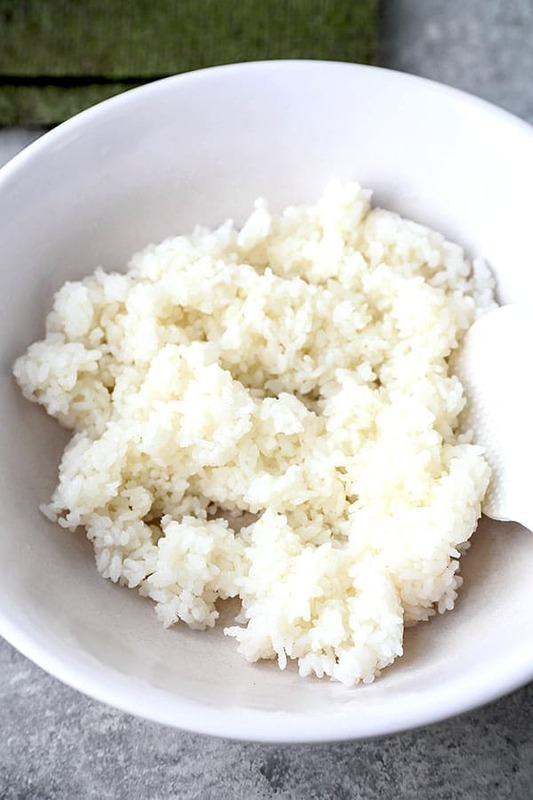 Check out our video on how to make Japanese rice! Think of these perfect grains as the mega-talented baseball player that just happens to play center field as well as he plays shortstop. Oh – and he pitches too!? Amazing! And hey – check out my post on how to cook Japanese rice in a rice cooker and on the stovetop here. 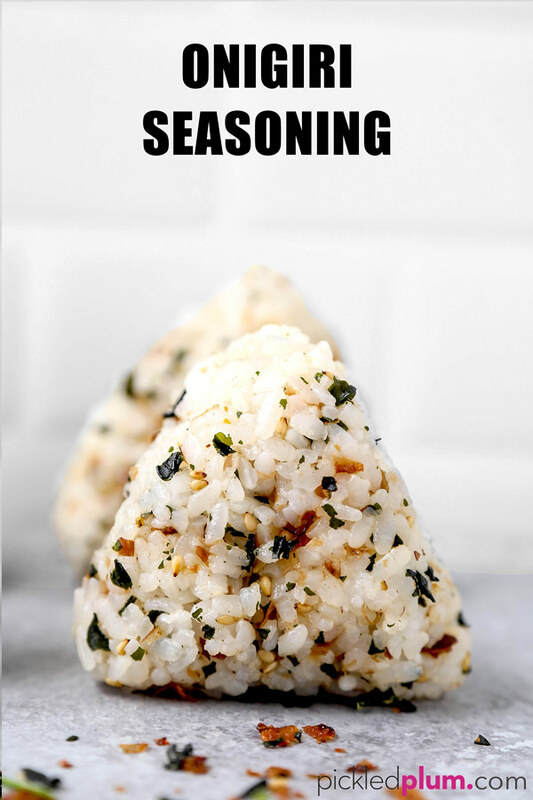 Unfortunately, you can’t use anything like jasmine, wild rice or sticky rice to make onigiri. The textures of those wonderful grains just won’t work for our rice ball making purposes here today. Luckily, Japanese rice is super easy to find these days online and in many grocery stores! What can I put inside rice balls? Now, this is the fun part! Some of the more common Japanese-centric onigiri you’ll typically see are tuna-mayo, ikura (salmon roe), kombu (simmered seaweed) and, Ben’s favorite: mentaiko (spicy salted pollock roe). Obviously, I have a SERIOUS soft spot for umeboshi onigiri. You see, umeboshi are the sour Japanese pickled plums I love so much that I named my blog after them! Okaka (おかか) – a savory combination of fermented and dried skipjack tuna or bonito flakes (katsuobushi) and soy sauce. Deep and salty in flavor. Shiozake (塩鮭) – salted salmon, oven-roasted and flaked. This mild yet savory Japanese salmon onigiri preparation really lets the richness of the fish shine. 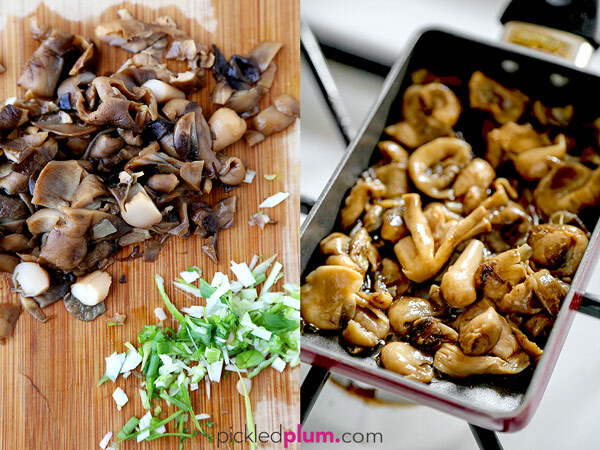 Mushroom and Scallions – finely chopped straw mushrooms, quickly pan sauteed with a bit of soy sauce, mirin and sugar. Minced green scallions are added at the end. Umami, sweet and complex flavors. Furikake (ふりかけ) – a pre-packaged rice seasoning mix, typically comprised of dried ground fish, seaweed, sesame seeds and spices. 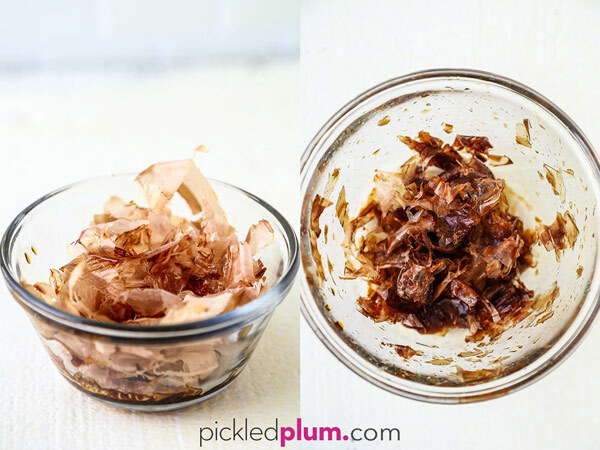 This savory goodness gets mixed in with your cooked rice before forming your onigiri. Oh my, it’s delish! I hesitate to call the fourth version a ‘recipe’ – since furikake is a dried pre-made rice seasoning that we’re just stirring into cooked rice. 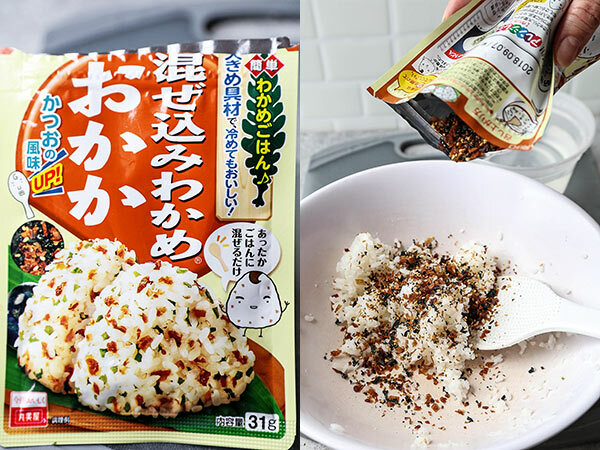 But furikake onigiri is soooo delicious (and so simple) that I think the outsized flavor warrants a mention for sure! 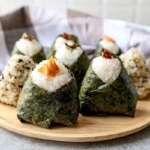 Now, while you definitely must use Japanese rice to make Japanese rice balls, the world is your absolute oyster when it comes to the onigiri fillings you can use! While I’ve shaped my own onigiri in the most common triangular way, there are many shapes and variations to onigiri / musubi. Some people prefer their onigiri to be formed in a circular fashion. You can use your hands or even a ring mold to get some perfect-ish circles. It’s also common to see cylindrical onigiri. This flattened oval is called tawara and refers to the shape of old school Japanese straw bales. Heck, you don’t even have to add fillings to your rice balls. My mom makes a mean onigiri that is just salted rice and high quality roasted nori. Another popular and delicious variation is yaki onigiri (grilled onigiri). Simply place your rice ball in a grill pan until the rice browns and crisps on the outside – then repeat on the other side. Then, if you’re so inclined, you can brush each side lightly with miso or soy sauce – or even a bit of sesame oil. 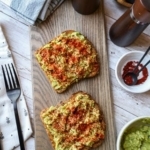 This method is not only delicious, it adds some real texture to the mix! Another, more modern permutation is onigirazu (おにぎらず) – which is basically an onigiri in sandwich form. The rice mimics the bread of a sandwich – and it’s common to see waaay more ingredients inside an onigirazu than in a traditional onigiri. Ham and cheese onigiri?! Well if it’s an onigirazu, then it’s totally fair game! 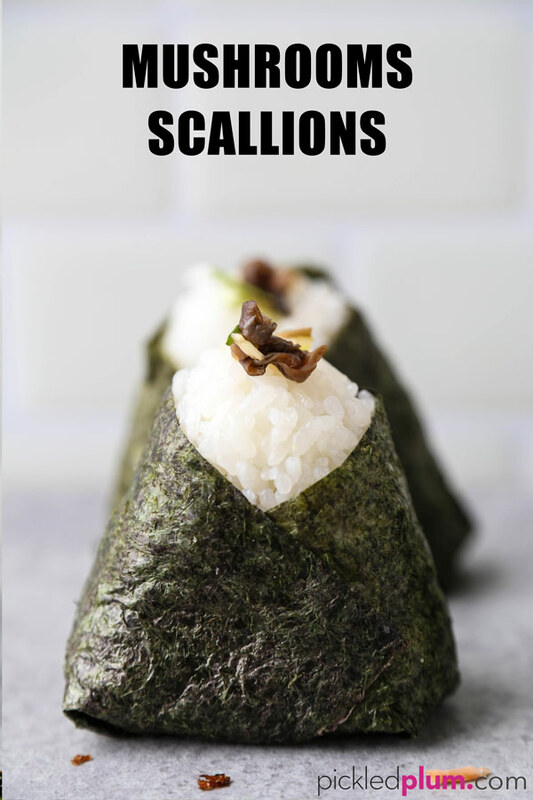 While you might find ikura (salmon roe) or negitoro (chopped tuna and scallions) as a filling in an onigiri, it’s not the filling that dictates the name. It’s all about the rice! You see, even ingredients commonly seen in sushi preparations defer to the rice for the name they receive. Here’s the way my mom tells it: if you add vinegar to Japanese rice – no matter what shape you make it into afterwards, it’s sushi. Onigiri is salted, pressed rice – no vinegar in sight. Full stop. As soon as you introduce vinegar, even if you shape it into an obvious onigiri shape (and even if there’s no fish involved) – you’re left with an onigiri shaped piece of sushi. So, to recap: Vinegar is for sushi. Salt is for onigiri. My mom is such a boss! Hopefully, by now, some of the pressure is off – and you’re feeling confident in your own onigiri making abilities. After all, no one is expecting uniform and perfectly shaped onigiri on your first try. Heck, the Japanese rice just needs to stick together (and not have any added vinegar, ha!) to count as official onigiri. 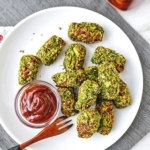 My hope is that you try these out at home – and get to experience first hand the magic that occurs when rice, nori, a few grains of salt and a simple filling all meet up in a yummy parcel of goodness. And, if you’re still on the fence about making your own, I highly recommend dropping into one of the many thousands of konbinis in Japan to have a taste test! Look at it this way though: you won’t need any frequent flier miles to make your own onigiri at home! How about you? Have you tried onigiri in Japan? What about a cultural mash up like Hawaii’s Spam musubi? I’d live to hear about your onigi experiences in the comments! 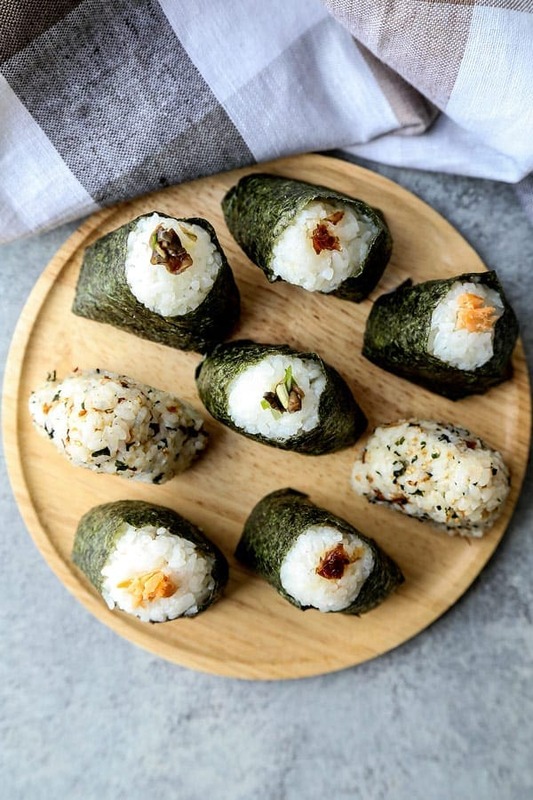 Did you like these Onigiri Recipes? Are there changes you made that you would like to share? Share your tips and recommendations in the comments section below! Four simple and delicious recipes for Japanese rice balls (onigiri). In a small bowl, add dried bonito flakes and soy sauce. Stir until the bonito flakes absorb all the soy sauce. Set aside. 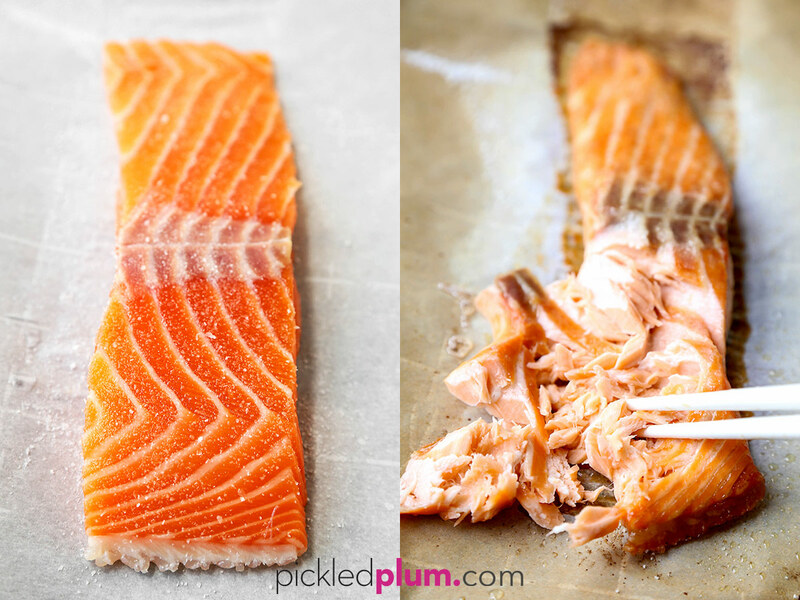 Sprinkle salt on both sides of the salmon filet and transfer to a cooking tray covered with parchment paper. 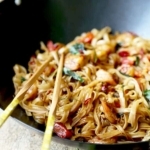 Flake the cooked salmon with chopsticks or a fork and set aside. In a small pan over medium heat, add mushrooms, soy sauce, mirin and sugar. Cook until the mushrooms have absorbed the liquid (about 1-2 minutes). Turn the heat off and transfer to a bowl. Let cool to room temperature and mix in scallions. Set aside. Grab a sheet of nori and cut it into thirds. Set aside. Place a small bowl of water in your prep area. Wet your hands with water. This is to prevent the rice from sticking to your hands. Scoop between 1/3 to 1/2 cup of rice into the palm of your wet hand. Create a small indentation in the center of the rice by pressing with your thumb. Add about 1/2 tablespoon of filling to the center indentation and press gently. Shape the rice between your palms into round or triangular shapes by gently pressing. Don’t press too hard (but hard enough that the rice can hold a shape). Sprinkle a little kosher salt around the exterior of the onigiri. 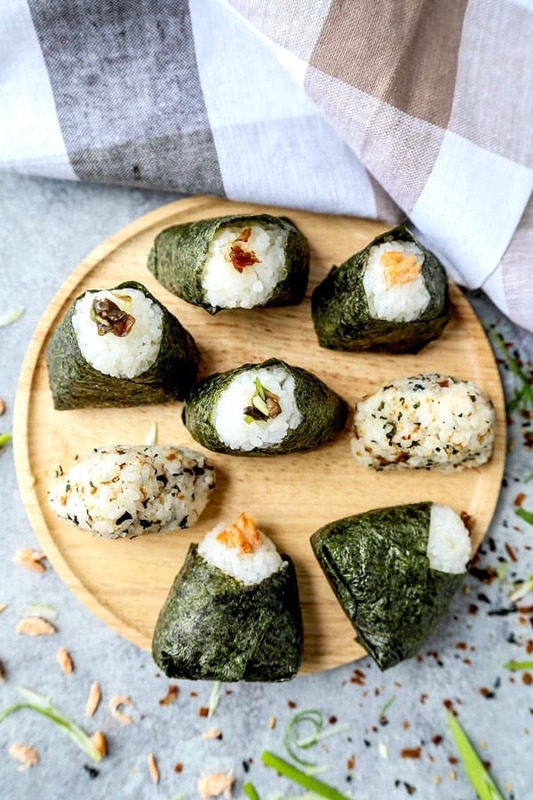 Grab a piece of nori and wrap it around the onigiri, like you’d wrap yourself in a blanket. If making multiple flavors, top each onigiri with a little filling to indicate the flavor. Set it on a plate and repeat the same steps until all the rice is used. Serve. Sprinkle desired amount of furikake seasoning on the cooked rice and mix well. Shape rice into triangles or balls and serve. YUM……brings back memories of when my parents took me, my 4 siblings and a couple of neighbours to the annual church picnic. My mother always made Onigiri, teriyaki chicken, teriyaki salmon, and of course can’t forget the veggies, fruit and watermelon. Your recipes bring back a flood of memories…..Wow!